• Boil Noodles in briskly boiling Water (400ml) and simmer for 3 minutes. • Mix Seasoning Powder, Chilli Powder (according to taste), in a bowl while noodles are being cooked. • Stir Noodles with the Seasoning and mix well. 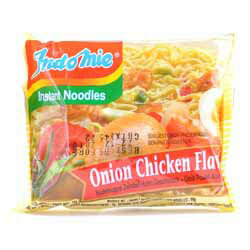 Noodles: Wheat Flour (70%), Refined Palm Oil (contains antioxidant E319), Tapicoca Starch, Salt, Acidity Regulators (E501, E500), Thickener (E412), Colour (E101). Seasoning Powder: Salt, Flavour Enhancers (E621, E627, E631), Sugar, Pepper, Garlic, Yeast Extract, Leek, Onion Powder, Acidity Regulator (E330), Artificial Chicken Flavour (1%). Seasoning Oil: Refined Palm Oil (contains antioxidant E319), Onion.